Item #45296 : Original era manufacture. 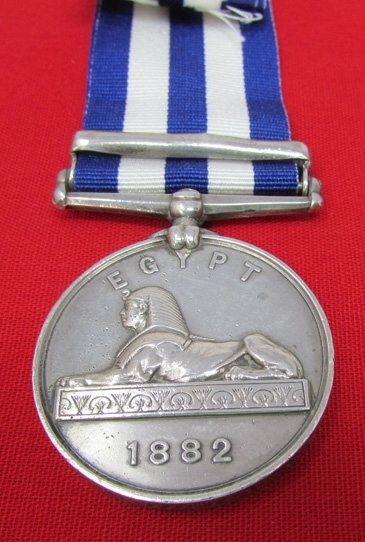 Silver Egypt medal with an 1882 dated reverse and clasp as issued for the bombardment of Alexandria which occurred on July 11th 1882. Named on the edge to W. S. Mullins A.B. HMS Temeraire. 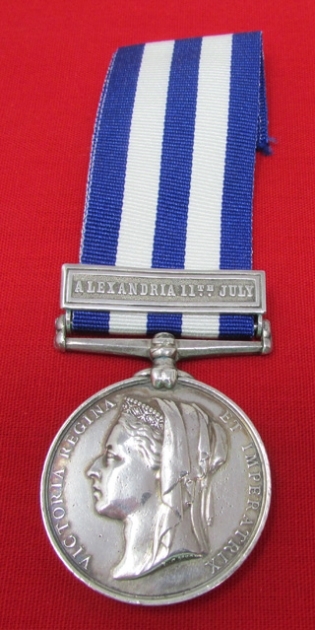 Minor pitting to the face from the Khedive star, newer replacement ribbon. HMS Temeraire was a an ironclad battleship of the Royal Navy. She was commissioned in 1877 and sold for scrap in 1921. During the bombardment of Alexandria Egypt in 1882, she fired 136 11 inch shells, and 84 10 inch shells at the Egyptian forts.While engaged with the Egyptian Mex Fort, she became grounded on a reef, HMS Condor came to her aid and she was refloated.